What happens when a table document is imported into a MAXQDA project? The first worksheet in the Excel workbook will be imported. Hidden columns in Excel will also be imported. The columns are numbered according to their order, whereby the contents of the first row will be used as the column header. The entries in the first line of the table are used as headings. The row order will remain the same when imported. The font will be standardized. As a rule, we recommend that you use tables in text documents only sparingly. This not only increases your analysis options (e.g. automatic coding at paragraph level), but also increases the performance of the display. We particularly advise against importing interviews in a table structure in which each response is contained in a separate row. Table documents in MAXQDA will be automatically formatted. It is not possible to modify the text format. You can zoom into the table using the zoom icon in the “Document Browser” toolbar. The font will appear accordingly larger or smaller. The height of the rows will be automatically set to the height of the largest cell. Please note: When importing, the columns are numbered according to their order in the Excel document. The number is at the beginning of each column heading and cannot be changed post-import. Please note: It is not possible to modify the column type if the column contains coded segments. The column widths and column positions can be modified using Drag & Drop. Like overview tables, table documents in MAXQDA can be sorted by clicking the column header. The original order can always be restored by right-clicking on the column header and selecting Reset sorting. Alternatively, you can click on the empty column header just above the row number. 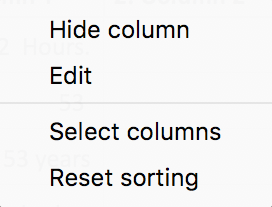 Hide – hides the column. 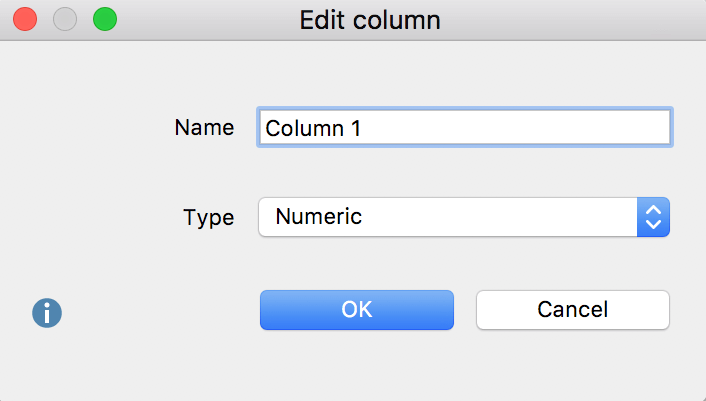 Edit – allows the modification of column name and column type. Select fields – opens a window in which the columns to be displayed can be selected. Reset Sorting – restores original order after import. The row numbers are fixed when the table is imported into MAXQDA, and cannot be modified. A row in the table corresponds to exactly one paragraph. Within a cell, there is no differentiation between paragraphs. The contents of individual cells can be modified. In order to do so, click on the Edit mode on/off button in the toolbar of the “Document Browser”. Tip: To insert a paragraph within a cell, hold down the Alt key (Windows) / option key (Mac) and press Return. Any text segment of any cell can be coded. First, double-click on the cell in order to select the contents. The cell will then be outlined in yellow, and you can mark a text segment. All of the usual MAXQDA coding options, including color-coding and coding with emoticons, are now available. It is not possible to code across multiple cells. Please note: When you hide a column, the corresponding coding stripe in the “Document Browser” will also be hidden. The retrieval options for coded segments in table documents are identical to those for text documents. For example, overlap will be handled in the same way as it is with normal text. The retrieval functions also include hidden columns and are based on the current configuration of the table. Retrieval functions for a single row correspond to those for a single paragraph. The Near function in the Code Relations Browser and Complex Coding Query applies to columns in table documents. This means that only the vertical proximity of two codes, and not the horizontal or diagonal proximity, will be taken into account, and that coded segments in different columns will never be found, when using the Near function. Click on the source data in the “Retrieved Segments” to indicate the coded text in the “Document Browser” and display the corresponding column. Right-click on a cell or marked text segment within a cell and select Insert Mem for Selection. When you click on a memo symbol, MAXQDA will indicate to which cell this memo is assigned. Please note: When a column is hidden, the memos assigned to the cells in this column will also be hidden. In principle, hidden columns in table documents will be taken into account when using Visual Tools. Code Matrix Browser functions as with any other type of document, as only the number of coded segments for a particular code will be analyzed. Code Relations Browser functions as with overlapping in normal text. Overlap can only occur within a particular cell. The “Near” function will search only for coded segments in the same column. Codeline Each row represents a paragraph in the Codeline – the column structure is ignored in this case. Hidden columns will be taken into account. Paragraphs will be sorted in their original order. Document Comparison Chart As with the Codeline, each row in the table represents a paragraph – the column structure is ignored. Hidden columns will be taken into account. Paragraphs will be sorted in their original order. Document Portrait This tool operates differently than with regular documents. Columns will be more or less ignored; cells will be processed from left to right, then top to bottom. A one-dimensional structure is then created, which is displayed as usual in the Document Portrait. Table documents cannot be printed directly from MAXQDA; they can, however, be exported in Excel format. Click the Export Displayed Document button in the Document Browser or select Project > Print > Displayed Document from the main menu. Alternatively, you can right-click on the document in the “Document System” and select Export.